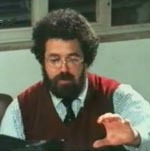 Giuseppe Sinopoli Interview with Bruce Duffie . . . . .
GS: It is more interesting, more complex, because when an instrumentalist plays, it is with something that is outside his body. But the singers work with their bodies and with the whole complexity, of this phenomenon. It is the psychological complexity which has a precise influence, and I think that is necessary for a conductor, when he works with singers, to really understand the connection to his psychology, and the influence of his psychology to his work. They are something, these artists. They are fantastic, but they need one comprehension, one very precise psychological comprehension, and we work with this comprehension. In one case, we had very big result with a singer when I was in Bayreuth for Tannhäuser. Officially, the singer was sick, and he had had a very big disaster there before, and also in Vienna with the same part, so everyone was afraid. But we worked very hard, and the work was musically and psychologically taxing. The result in the evening's performance was fantastic. It all came together and was a big result. GS: [Takes a breath in preparation for answering the question] I think that it's almost a half for each. I work normally with two new productions a year and no more. They are almost twenty or twenty-five evenings. GS: Yes... Bayreuth is seven. I will not accept more. I have more propositions, but I cannot accept, because the work in the opera must be very precise and very intensive. GS: It's more complex, I think, because when I work with a orchestra, if the relation is good, the complexity is almost solved. But in the opera you have other complexity. You have orchestra, you have stage, we have producer. You have many, many, many, many things. Normally, I divide my work with the Vienna Staatsoper, Covent Garden, Berlin, and the Metropolitan. GS: I try always to work systematically. I worked many years with Verdi and I will continue it. Then I start, five or six years ago, to work on the Puccini. And now I start with Wagner. I think these three composers will be, for me, very important in the next years. I don't like to conduct other operas at the moment. GS: Oh! [Chuckles] It’s very, very complicated. You know, the problem in Bayreuth is that the orchestra is underneath the stage, and the sound from the stage comes directly into the hall. So the orchestral sound always comes later because it must be reflected onto the stage, and then from the stage it comes back into the hall. The problem is you understand this problem, this acoustic difficulty, or you never understand. [Laughter] If you understand, then it can be that you solve the problem. And if you don't understand, there will be no solutions. GS: There are two operas which are more difficult for Bayreuth: Meistersinger and Tannhäuser, because in these two operas there are very big ensemble scenes, with different positions. The Tannhäuser second act is very difficult, but I was very happy to hear from the orchestra, and from Mr. Wagner, that the ensemble in Bayreuth for Tannhäuser was never so together as in my performances. They told me this at the fifth rehearsal. The problem is that you must conduct differently in every ensemble scene. You have to accept the different sound delay - from the stage and from the orchestra - in order to keep it all together. If it sounds perfect to the conductor, it will not be perfect for the audience. GS: Yes! You must have. You must anticipate the trombone and the whole brass, so that in the hall they will sound together with the strings. The brass are so far down in relation to the strings. There's almost a seven meter difference in the level. So you must accept this delay and anticipate it. GS: The problem is that the players in the orchestra are under the stage, so they don't hear the stage. Just the strings hear the stage, but the brass section does not. They must play on the beat. They must have confidence in the beat, and if your beat is not organized, then it's a little disaster. BD: But you've managed to solve it. GS: [Chuckles, obviously surprised and amused at such a prospect] I don't think so. GS: It's not something connected with the day. Of course, it’s important to every metabolic situation. [Chuckles] But I find that for me, sometimes, the rehearsals are much better than the performance. The problem is when will be the right performance? In the concert, or in the rehearsal? For me, the performance is the moment in which orchestra and conductor try to write its identity, and find the identity in the music. Sometimes the orchestra is more prepared - typical is Vienna Philharmonic - to identify itself in the performance, and not in the rehearsal. But sometimes, with English or American orchestras, or other German orchestras, it's also possible to have the same in the rehearsal. GS: I think so, because if the music is just something technical, it must be the same. But if the music is something more connected with us in its sensibility and culture, then it can be different in every performance. You don't play with the same intensity with your child every time, or make love with your partner the same way. Perhaps you can be the same in your office. I think that it depends on the investment that you have in what you realized. GS: Enjoy? It's not the right word. I enjoy to eat something very good, or to drink a good wine. This is enjoyed. But to say conducting is "enjoyed" I don't think is the right word. You can enjoy it, perhaps, for 30 seconds after the performance if something was good. But I think that conducting, or playing music, or being involved in the music is something too complex to be just enjoyed. GS: I think that recordings are documentations from the way that you felt in your heart at the moment. I never think commercially, and Deutsche Grammophon is very, very kind to understand this about me. I never record something just for commercial reasons. They asked me if I could record this, this, this, this. I did perhaps just one project at the beginning of my career that was meerly commercial, and I was very disturbed. It was this opera-chorus recording on Philips, and I did not understand. I invest, perhaps, more time in this record as in the other records because it was very dangerous to be just commercial, and play from beginning to the end some chorus things without being totally invested in the moment with the composer of the opera. But in the end it was very nice. Few Deutsche Grammophons are just commercial things. I remember a comment made to me by a player. When we recorded the Siegfried Idyll, the first horn of the Philharmonic said to me, "Mr. Sinopoli, it's very strange. You are, in the recording, more involved than in the performance." And I said, "Yes, of course, because when you are in the performance, you are involved with many things: with the people, with the audience, with the moment. When you record, you are totally free, absolutely free to realize music without the microphone." I am not disturbed by the microphone. We can be absolutely free, technically free, because if you do something wrong, you can repeat. Then you can realize the more dangerous risk in the expressions, I think. GS: I talk very intensively about this problem. Sometimes I have a project to realize an opera in the theater and then on the recording, and sometimes I record before it is realized in the theater. It is the case with Rigoletto and Butterfly. I think in the theater, sometimes you are influenced by the stage producer. When you have confrontations, you can accept or not accept their ideas, but you are influenced, in any case, positive or negative. The problem is that once in awhile this influence is because it’s connected with an important name, with this person Mr. X, Y, or Z. When recording an opera, I can be more totally involved in the dramatic idea through the music and not from the stage. You must have this because when you listen at home, you don't have the stage to see the drama. And for me, it's easier to realize this dramatic idea if I record in a studio rather than in a live performance. I can be more free, I can have more fantasy, I can have more freedom. I know that some conductors and performers are disturbed by the atmosphere created in the studio by the microphones. I don't find that myself. It makes them nervous, but I feel more free. I know that seems strange. BD: What about the public that listens to a recording - and its perfection - and then comes to the theater or the concert hall and expects that same perfection? GS: I think this is something wrong in our music world. It is not correct in this way because you have, on the record, the best singers occasionally, the best conductors occasionally, the best orchestra occasionally, the best instrumentalists occasionally, and you don't find those same conditions in the theater. You have, normally, a good orchestra, but not the best, perhaps. You have, perhaps, a good conductor, or the best conductor but not the best singers. In the opera house it is not the same. The difference is that when you are in an opera house, and you have a good performance with every limitation in the acoustic sound, because you cannot hear so well as on your compact disc, because you sit in a very strange gallery and it's okay but the sound will be, perhaps, not the best; the orchestra will be perhaps not the best; the singers will be perhaps not the best; and the conductor will be perhaps not the best. But, what is fascinating in an opera house is the time, the time in which the music and the dramatic idea is developing. You cannot have the same in the studio. You can be absolutely involved for ten minutes or 15 minutes, and then the next day we continue it. But you can't have the same dramatic continuity in the time that you would have in the opera house. Then, if you have, in the opera house, the best orchestra, a good conductor, and good singers, or the best singers and a good orchestra, then can be even more fascinating than on a recording. It presents difficulties. I think that records and recording are something typical of our technological society. It's one of the more dangerous characteristics of this society. It is impossible to have from all people the same "best." You can, perhaps, achieve the best recording of Butterfly, or of Don Carlos, or of Otello. But you cannot have, every day, in the world, the best Otello, or the best Butterfly. You can realize, in one precise moment, in one precise product, the concentrations from the best. But this is not the normal possibility. You can build the best airplane, but it's not possible for every person to go in this airplane. It is our responsibility to concentrate and give our best work on the record, and for this reason, I think, the record is an important documentation for us. It's a big responsibility. GS: It's very difficult. I can say that I tried to realize my best, but I am always very critical with myself. I try. I think that what I realize until now was honest, and was the best that can be realized. I think so. BD: It doesn't bother you that this will be, perhaps, the 25th recording of Butterfly to appear on the market? GS: [Thinks for a moment] It would be the same if you asked how many relationships the woman that you love has had before. You can't. I love Butterfly. I don’t know with which man Butterfly was before me. It's not important. BD: You've done some composing? BD: So you won't go back to composing, then? GS: Sometimes, yes. The problem is that in America it's more possible, if you have American orchestra, to realize modern music. But in London it's almost impossible. GS: Because we have always a confrontation with the box office. We don't have big subsidies from the government, and we must work very intensively, and we are always having confrontations with the box office in London. For this reason it is very difficult to play modern music, because the audience is not very interested in this. BD: If a composer comes to you and says, "Maestro, what suggestions, or what advice do you have for a new composition? ", what do you say? GS: I think that it’s important today to inform the audience about what the composer realize. And the tolerance must be absolutely important in these decisions. If you ask me which composition or which composer I decide to play, I think that one argument to decide can be the professionality from this composer, and the consequence between his idea and what he realizes in the score. It's not so easy to say [taps on the table when he mentions each composer] why I will play Mr. Nono, and why Mr. Rihm, or why Mr. Birtwistle, or why Mr. Maxwell Davies, or why Mr. Matsudaira. [See my Interview with Sir Peter Maxwell Davies.] I try to decide when I see the professionality of the idea of the composer. The name is not important. GS: [Pauses for a moment] I have big ideological suspicions about the last Stockhausen work, but I think it's important that the people get to know his music. I think other works are more important. BD: Let me turn the coin around. Do you get involved with old music - Monteverdi, Cavalli, Schütz, perhaps? GS: [Breathes deeply] You cannot be involved with all music. I don't think so. I considerate very much on this music, but we cannot be involved with all it. The life is so short, and I cannot understand a conductor that performs [again taps on the table for each composer] one day Rossini, one day Wagner, one day Mozart, one day Verdi, one day Puccini. GS: I cannot understand. For me it's very difficult to conduct just three opera composers. Every composer invested their whole life to writing his music, and I think it’s very dangerous to think that we are so good to invest just two weeks to learn an opera. GS: Ah, yes. It's very complicated. GS: [Thinks for a moment] I hope that the people understand that it is rather complicated. [Chuckles] If they don't understand, it's very dangerous. GS: Thank you. It was an interesting interview. That's why the time went very quickly. Few, if any, conductors of the post-war generation vexed the public and critics as much as Giuseppe Sinopoli and, as a result, he suffered the opprobrium few of his rivals had to accept. His predecessor at the Philharmonia, Riccardo Muti, was largely adored, yet Sinopoli, without Muti's Italianate good looks, and with a marked tendency towards reinventing the music he played, was tolerated - but never loved. Yet, Sinopoli brought with him to London a golden record contract with Deutsche Grammophon and lucrative overseas tours - notably to Japan where he was fêted with the same degree of fascination as Celibidache and Karajan had been before him. He stayed with the Philharmonia until 1994 - a career move for both. Sinopoli's career was marked by fascinating contradictions. After his appointment as Principal Conductor of the Philharmonia many conductors who had worked closely with the orchestra refused to do so whilst Sinopoli was its chief conductor. Muti, Ashkenazy and Rattle were just three who believed, rightly or wrongly, that Sinopoli would destroy that 'special' cohesiveness', that 'special' sound that had become the orchestra's hallmark. In many ways his first recording, a glowing coupling of Schubert's Unfinished and Mendelssohn's Fourth, showed that the Germanic sound which Muti had inherited from Klemperer, and which he himself had started to replace with something warmer, was being taken to its Italianate conclusion. The recording was noticeable for a beauty of string texture few orchestras could match and a balance between woodwind and brass which suggested a mercurial hand at the helm. The reviews were good - but that proved a short-lived phenomenon. As soon as he touched Mahler the critics attacked him with a venom almost unheard of in London's music press. 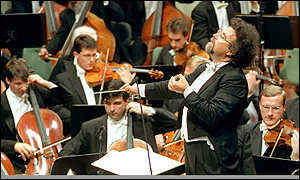 In another famous incident early on in his career, during a Vienna Philharmonic concert, the orchestra were certain Sinopoli had lost his way in the score. For many years they refused to work with him. Later, however, he returned to the Vienna Philharmonic - and one of Sinopoli's greatest recordings, Strauss' Elektra, shows both orchestra and conductor firing sparks off each other. Contradictions indeed. 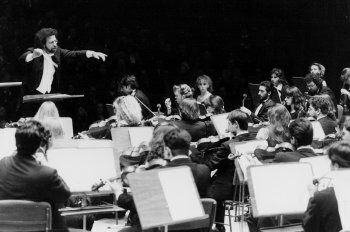 If great conductors stamp their authority on the orchestras they conduct by giving them identifiable sounds then Sinopoli was a great conductor. Hear the Philharmonia today and they still have that Sinopoli warmth. Read countless reviews of the orchestra in repertoire from Mahler to Vaughan Williams and it is the 'sound' of the orchestra, particularly the strings, which are most mentioned. 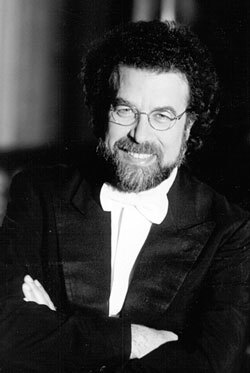 Sinopoli's reinterpretation of familiar scores owes much to his bilateral training, first as a doctor, and then as a composer. On the one hand he literally dissected the music so it achieved uniform transparency (his Mahler Das Lied von der Erde being a perfect example). On the other, he brought a composer's insight to a conductor's role, deconstructing here and reconstructing there. There was, however, always an intellectual rigour to a Sinopoli performance and if his Mahler did not always reveal this his Bruckner, which he turned to later in his career, definitely did. Recordings of the Fifth, Eighth and Ninth symphonies have towering strength and are amongst the finest of the last decade. Hear a Sinopoli Bruckner symphony and you hear textures and notes which are missed in other performances. Compare Sinopoli's Dresden Bruckner with Jochum's Dresden Bruckner and you hear the correct balance versus the obtuse balance. Sinopoli's brass were gloriously restrained, whereas Jochum's sabotaged the detail. Sinopoli was, however, probably a finer opera conductor than he was a symphonic conductor. If there is a literal reason for this it probably harks back to his original training. Opera has much more to do with the psyche and character than many symphonies could ever hope to achieve in their short span and Sinopoli was probably able to extrapolate the theories of psycho-analysis and criminal anthropology, which formed the basis of his psychiatry dissertation, in many of his performances. Yet, far from being cool and calculating his performances on record achieved levels of sonority and sensuousness eschewed by conductors before and since. Take any one of his Philharmonia recordings of Puccini - whether it be Madama Butterfly, Tosca or Manon Lescaut - and the end result is of a conductor who knew how to attain the bel canto line. Miraculously, he even achieved this same level of beauty in Wagner - at a time when many incinerated the inherent beauties of the Wagnerian line. It is unfortunate we do not now have a Sinopoli Tristan - for I am sure he would have recorded one had he lived. In this most revolutionary of scores Sinopoli's ear for detail would have borne extraordinary dividends. In Strauss he was masterly - with probably the finest recordings in modern sound coming from Sinopoli (see my surveys of Elektra and Salome on record). His recording of Strauss' Die Frau Ohne Schatten might have been a first choice for the work were it not cut. In Mahler he will always remain controversial. The best of his Mahler - the Fifth, Seventh and Ninth symphonies, as well as a truly staggering Eighth - all benefit from meticulous detail and wonderful playing. Yet, I remember hearing a Sinopoli Mahler 5 soon before he left the Philharmonia which achieved extraordinary levels of spontaneity, decrying the element of over-preparedness which always haunted a Sinopoli performance. In the Ninth he was less emotional in the final movement than many expected, and in the Seventh he achieved an assimilated schizophrenia which still shocks. His Mahler may yet prove to be his lasting achievement - a way of looking at these over-familiar scores which will soon become the norm. Only now are we hearing Benjamin Zander's exacting performances of these scores. Zander's way with Mahler is closer to Sinopoli's than many critics like to admit. Sinopoli was such a maligned conductor - even from within his own profession - it is difficult to be objective about him. Many were - still are - astonished by his early meteoric rise yet his move to Dresden after a short bout with the Berlin Deutsche Oper has proven the crown of his career. Here was an orchestra with over 450 years of history working with a conductor who demanded almost impossible, and reinventive, intellectual demands from his players. Yet, the results were not just plausible - they were symptomatic of an openness to compromise, a willingness to understand - something which Sinopoli had been unable to secure from the Philharmonia. Sinopoli had the misfortune of being a conductor at the same time as the growth in authentic performance. Whilst that showed Sinopoli to be more unfashionable in Beethoven than many of his contemporaries - such as Simon Rattle and Claudio Abbado who both drew on the authenticists for more modern interpretations of the 'masters' - it clouded Sinopoli's main achievement. That was to bring a freshness to music making which made those who were willing to listen challenge their own pre-conceptions of works they thought they knew. Hearing Sinopoli conduct a work, as you had a score in hand, was a sublime experience --you could tangibly understand why a conductor had written something this way when you often heard it played another. He was not a literalist in the Abendroth mould more a free thinking spiritualist in the Celibidache mould. Sinopoli's time will come, the incompleteness of his work fully understood. His death, fittingly (or as fittingly as death can be), whilst conducting a performance of Aïda in Berlin brings his career full circle: this was the very work he made his debut with in 1972. It brings a perverse symmetry to a career which was more asymmetrical than most. A great conductor? I think posterity will probably suggest this is the case. 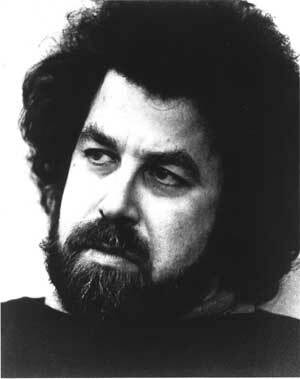 Giuseppe Sinopoli, conductor and composer, born 2 November 1946; died 20 April 2001. This interview was held in Chicago on September 1, 1986, and portions were aired on WNIB (along with recordings) several times thereafter. It was transcribed early in 2007, and posted on this website at that time.